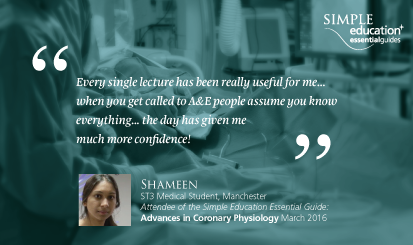 This is the first part of the the Simple Education Essential Guide to Coronary Angiography, Stenting and Structural Intervention course. This module the definitive guide to coronary angiography and right heart catheterisation will guide you through all aspects of safely and successfully managing patients from clinic to catheter lab. This 4 module series incorporates the BCS and BCIS curriculum and NICE and ESC guidelines. This course is organised and run by Simple Education and is kindly supported by Medtronic, Volcano Philips and AstraZeneca.